Back in the day, before I got my first GSD I read what I could about dogs in general after realizing I wanted a larger. I wasn't sure if it would be an Airedale, a Boxer or a Doberman, but I was sure it would be one of those. Then, I would have to find a trustworthy breeder which was already turning out to be difficult at best. I kept reading and searching for info about my future friend. Then, I found a breeder! She was and is a feisty broad who did not breed Airedales or Boxers and she had just stopped breeding the Doberman! Today, I couldn't tell you how I found out about this lady, but I was, and am lucky. She didn't often breed her dogs, which at the time I didn't understand. She had been breeding the Doberman, Rottweilers and German Shepherds. Her female Rottie hadn't been bred in a couple years (or this story might have been about my Rottweiler!). But, she was expecting a litter of Shepherds. 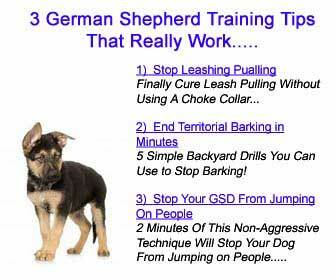 I had read NOTHING about Shepherds! When she called about the puppies, I made a date to see them though they were way too young to leave their mommy. Much later in the breeder's yard, I waited kind of nervously. All I had gotten for this new family member was a crate and a few toys. I didn't know what to expect when I heard her talking in the house and had no idea she was talking to the puppies. I heard a bunch of puppy noises as response to her encouragement. They were trying to bark. When her side door opened and the whole crowd (6 boys) tumbled out all wiggly and happy, noisy and curious. It made my heart seem to stop. I had never seen puppies that young before. I couldn't help but giggle at their antics, chasing each other this way and that only to tumble over each other awkwardly. Except one who came up to me and grabbed my pants leg. When I reached down to try and pick him up he took off after his brothers evading me like a pro. The sneaky little guy came around and tugged at my left shoe string and took off again when I reached for him. 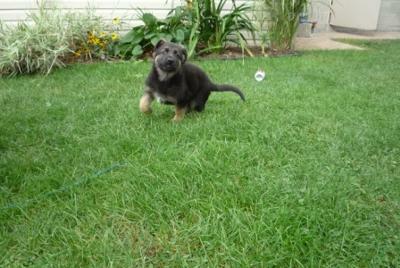 He ran off with his brothers and joined in the clumsy chase across the yard. I knelt down and tied my shoe while trying to keep an eye out for the pups in their wacky race around us humans. THEN, to my amazement, I felt a tug at my RIGHT shoe string. Looking around and saw one of the puppies was pulling the lace until it came lose. As I stood up, the little guy took off away from me again. I couldn't help but laugh. At the side door stoop, I put my foot up to retie my shoelace. As I was doing this, Mr. Puppy came behind me and promptly grabbed my left lace and untied that one again! I turned and reached for the culprit only to have him run around my feet and toying with me like he had been up to this for a long time. The breeder, an older lady, launched herself after the puppy (while hiding a chuckle at my attempt to catch him, I'm sure). She captured the wiggly guy and brought him to me. He licked my face and almost vibrated in my arms. I looked into his deep blue eyes. He seemed to smile at me, and then I put him down. "He's the one I want." I told her. He housebroke easily with ZERO accidents, and only made me prouder and prouder each day showing how smart he was effortlessly. He had no championship lineage, and compared to my boy I have now, he couldn't hold a candle with his size or physique, but he proved his power mentally and every other way he could daily. While he didn't have the champion lines my new boy has, with show lines going from his father to his great-great grandparents on both sides, he proved himself as a champion protector to me and our home. There isn't a day that goes by when I don't think of him with so much love that it sealed the breed of German Shepherd as a part of me and my heart forever. He and my new boy have the same name. Both of the boys proved, that German Shepherds do most certainly, rule. Comments for Do German Shepherds rule? ... what a cute story. Thank you for sharing.